Minnesota National Golf Course is a magnificent 27-hole golf course that was designed by renowned architect Joel Goldstrand and opened in 2009. 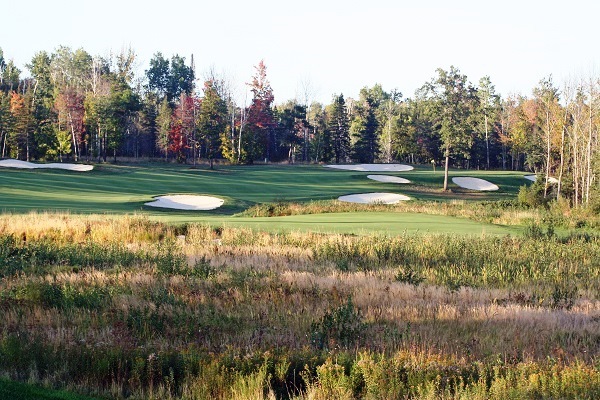 Built on 600 gorgeous lakeside acres of northern Minnesota wilderness and surrounded by towering pines, hardwoods and wildlife habitat, the18-hole Championship Course features bentgrass tees, fairways and greens, Ohio White Sand bunkers and plays over 7,200 yards to challenge the most avid golfer. Yet with 5 sets of tees, the Championship Course will easily accommodate players of all abilities. Minnesota National also features our “Savanna 9”, a great par 33 nine-hole track with quality greens and lots of character. Savanna 9 has become a favorite of many. Enjoy your round on either course in one of our GPS equipped electric Club Car golf carts with on-cart scoring and live “leaderboard” features. Minnesota National GC offers something for every golfer! And don’t forget about our 18-hole certified foot-golf course that opened in 2015. Be sure to visit our complete golf shop before and after your round, where you will find just about anything a golfer could need for an enjoyable day on the links. Our “Nineteenth Hole” is an amazing clubhouse where you can enjoy a beverage in the Irish-style pub, grab lunch in the restaurant, or sit out on the expansive deck overlooking fantastic golf vistas. Minnesota National Golf Course is the perfect place for a corporate event, golf getaway or dream wedding. Delight in the beauty and amazing craftsmanship with accommodations for 300+. This grand 20,000 sq. ft. clubhouse features 40 foot open beam ceilings, 5 stone fireplaces, 2 bars and 4 event venues with media. Additionally, Minnesota National GC offers a wonderful backdrop for any outdoor wedding, from our authentic old fashion barn by the lake to a serene pond-side setting. Check our website for Stay & Play packages, daily rates and special events. Golf groups, large or small, can stay right on the course in our Executive Log Home or one of our nicely appointed townhomes.